Parking for the U-M Comprehensive Cancer Center is in parking structure P1. If you have an appointment at a cancer clinic located in the Taubman Center, please note that you will want to follow signs to the Taubman Center parking structure A; further along East Medical Center Drive. Remember the Floor on which you parked. Bring your parking coupon with you to your appointment to be validated at the clerical stations for a reduced rate. Enter the Cancer Center Building from parking structure P1, 1st floor. When you enter the building you will be on Floor B2. The Information and Registration Desk is in front of you as you walk in the door. Please stop and receive your "blue hospital card" or you may update your registration information before you proceed to your destination. 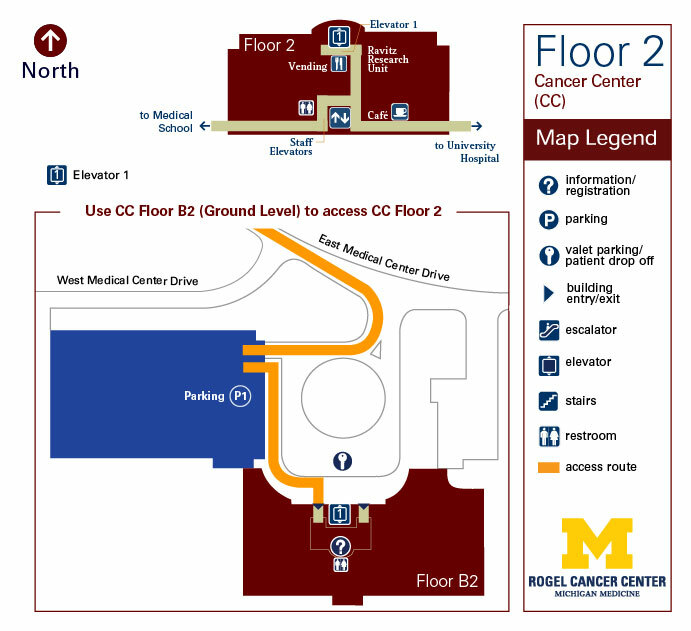 *Detailed directions to services located on Floor 2 of the U-M Comprehensive Cancer Center are listed below. Look for signage to assist you in finding your location. The elevators are across from the Registration Information desk on Floor B2. Take the elevator to Floor 2 to access University Hospital and other medical center buildings.